The industrial settings are known for loud noise levels in areas where employees work; this produces a risk of hearing problems and ear damage down the road. We offer disposable ear plugs to help reduce this risk by protecting ears on a daily basis with new, clean plugs. 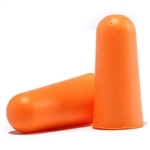 We also offer reusable ear plugs for those who wish to just keep one or two pairs around. We are also proud to offer Howard Leight ear plugs, which are renowned for their quality and performance, as well as ear plugs from other respected brands such as 3M, Bilsom, Radians, Elvex, Moldex, EAR and others. Browse our online store today and find the perfect ear plugs for you; if you’re looking to stock up, we offer safety ear plugs in bulk that provide an unbeatable value!